Keansburg Amusement Park to Re-Open 'Spook House' in 2016! 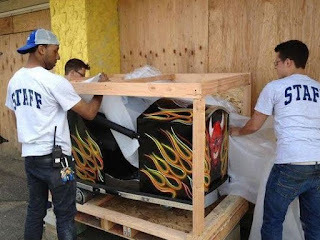 We've got good news for all you fans of Dark Rides and Haunted Houses! Keansburg Amusement Park in New Jersey has announced today that they plan to finally re-open their classic dark-ride attraction 'The Spook House' for their 112th season. Not only is Keansburg Amusement Park the oldest operating Amusement Park in New Jersey, it's been working since 2012 to rebuild ever since Super Storm Hurricane Sandy tried to wipe the park from the map. The ride had previously been an attraction at the park since the 1930's and is considered an iconic dark ride attraction. The park opens this Saturday in time for their Traditional Easter Egg Hunt. While the ride is listed as 'coming soon' on the website, we don't have an exact date on when the ride will open outside of 'Summer 2016'. Either way, it's wonderful to see a classic dark ride rise up and entertain once again! Please Visit their Website for more information on Keansburg Amusement Park!